Shopping for G.I. Joe Prop Replicas? Snake Eyes' katana from the G.I. Joe: The Rise of Cobra movie! Authentic sword replicated from the actual film prop. Hand-forged steel with hardwood sheath. A fully licensed replica from the G.I. Joe: The Rise of Cobra movie, this Snake Eyes Katana features a hand-forged, high-carbon steel, false-edged blade with double fuller grooves, etched G.I. Joe emblem, and a unique lightweight, skeletonized handle design. 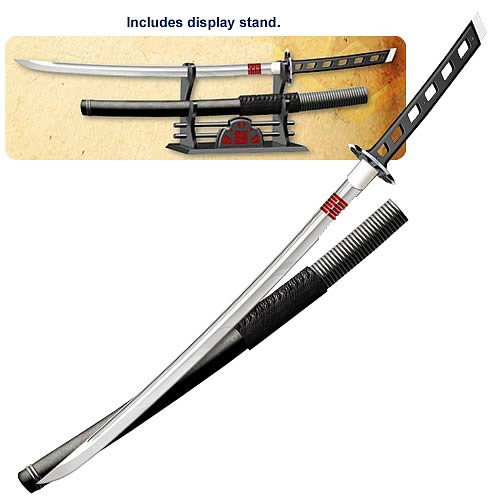 The sword is precisely replicated from the actual movie prop and includes a wood scabbard with authentic details, a decorative display stand, and a certificate of authenticity. Each amazing weapon is individually serial numbered, for collectibility. This sword measures 36 5/8-inches long, with a blade length of 24 1/4-inches. The katana is crafted of high-carbon steel with the handle reinforced with ABS overlay. The sheath is made of hardwood and leather wrap. This incredible weapon comes in a full-color box and includes a custom display stand for the sword and sheath. It's a bona fide ninja weapon that you can own! Snake Eyes is a ninja master and military commando who trains the G.I. Joe team in hand-to-hand combat. He received martial arts training in the Arashikage clan and is the enemy of Cobra ninja Storm Shadow. Silent and mysterious, this skilled warrior wears a visor that conceals his face.